As the story goes, Humpy Wheeler's daughter Patti introduced Aussie David Hill to the sport of NASCAR. Hill was under orders from News Corp. chief Rupert Murdoch to plant the FOX Sports flag in the states. Hill took one look at the Charlotte Motor Speedway, the loyal fans and the spectacle of 43 cars at high speed and was hooked. The result was a franchise called "NASCAR on FOX." Familiar TV faces like Darrell Waltrip, Larry McReynolds and Jeff Hammond have Hill to thank for their careers after racing. The sport has Hill to thank for coming along at a key moment in NASCAR history and as they say, "growing the franchise." Sports Emmy awards followed and Hill expanded the FOX Sports brand far beyond the world of NASCAR. The colorful Hill was a marked contrast to the monochrome network sports executives who prowl the mean streets of New York City. Hill decided to set-up shop in Los Angeles, have an adult beverage or two and speak his mind. After more than a decade at the helm, Hill has most recently been the chairman of the FOX Sports division. Things started to change when a young executive named Eric Shanks left DirecTV and joined FOX Sports as president in June of 2010. Six months later, FOX veteran Randy Freer was named co-president of the newly formed FOX Sports Media Group with Shanks. These two would now be in charge of all the networks, brands and digital properties involved with FOX Sports. The power had shifted to a different generation of executives who spoke the digital language and were concerned with brand marketing and image. The handwriting was on the wall. Monday it was made official that Hill was moving on. He will become an Executive Vice President of News Corp. itself. Hill will be working on international projects and new business. For the first time since he came across the pond, David Hill's influence will be gone from FOX sports. Hill was also key to establishing SPEED in Charlotte, NC and pushing for it to become the official NASCAR TV Network. While that part of the plan did not work out, there is no doubt that the very existence of SPEED is due to its core of NASCAR programming. Shanks and Freer are said to be actively negotiating with NASCAR on a new TV contract. There have even been hints that FOX wants more Sprint Cup Series races. The key question in the overall equation is the future of SPEED itself. Rumors are swirling that FOX will close SPEED, rebrand it as a general sports cable TV network and use it to chase ESPN in the program rights marketplace. SPEED currently carries the vast majority of the practice, qualifying and support programming for NASCAR. When there is heavy lifting to be done, from the Hall of Fame to the All-Star Race, NASCAR relies on SPEED. Certainly no new TV contract will be put in place without a strong foundation of what is called "shoulder programming" from SPEED or the newly branded sports network. While Hill was outspoken and opinionated, the new management duo is focused and calculated. What becomes of FOX Sports, SPEED and the company's relationship with NASCAR will be revealed before this year is out. There are many interested parties waiting for that answer. While Hill did tinker with start times and bring us Digger, the vast majority of his NASCAR influence revolved around promoting stock car racing to a larger audience. He ushered the sport through an uncertain time with gimmicks like the Hollywood Hotel and created personas like "Ole DW and Larry Mac." There was a time when "NASCAR on FOX" was king. Hill will remain based in LA, so there is little doubt that Shanks and Freer may wind-up having frequent conversations with the cantankerous Aussie when he thinks of yet another idea that seems perfect for the NASCAR on FOX coverage. Some things will never change. You are far kinder to Hill than he warrants, or deserves. Your oblique reference to his indulgence in "adult beverages" is an understatement and excusing his "carnival-ization" of the sport and its tv presentation as being creative are just wrong. He is and has always been a bully. An arrogant and mean spirited tele-thug who has taken credit for others ideas, walked over the bodies of hard working underlings and surrounded himself with "yes men" mafioso who only feed the insatiable ego that is David Hill. His career-long reliance on using his relationship with Rupert Murdoch to survive and get his way has, FINALLY, come to an end and Rupert now has to worry about saving his own skin rather than protect the misdeeds of Hill. Yup. Hill finally overplayed his hand and couldn't go crying to Rupert for help. Although I will go along reluctantly with you on what Hill brought in terms of "advancing" the sport in a time of need, I will forever remember him for digger, and the slow destruction of the integrity of the sport, with "Ole DW" and "Larry Mac". One thing the sport DID NOT need, was beefed up personalities in the booth. His Frankenstein created division, and anger amongst the fans. With the director constantly speaking into Darrell's earpiece, telling him to "Walk over" the others in the booth will resonate forever with me. In my opinion, Hill was a clown, who may have at one time had bright ideas, his animated buffonery with the NFL robot and Digger has been a thorn in my side for many years. With your careful wording of "focused and calculated" with the newbies coming in, makes me think "cold and calculated". As in more negative changes on the way, so we can have more "actuality" and "reality" programming, so the idiots of the world can stare at the tv, with the intellect of a throw rug.I certainly don't have a problem with you, John, I just cringe when I see David Hill's name anywhere. The first thing in the morning I do, is pull up the Daly Planet, so naturally I choked on my coffee.LOL.I can't afford to take the "wait and see" approach with these new guys, as everytime we have all said that, the changes across the board have been anything but positive for NASCAR. Shutting down Speed, and trying to mirror ESPN would be the worst thing in the world to do. 5 hours of talking heads analyzing a players' sore thumb? No thanks. I remember Hill's response to the fans complaints - it was one word. "Tough". I don't know if I agree that he advanced things for NASCAR at Fox. The early tv coverage of racing was good; the coverage since the renewal of the contract has been abysmal. The "creation" of Ole DW and the Digger nonsense are not necessarily fond memories. The frustrating part is that Fox, DW, Larry Mac & Hammond did such a great job for the first contract, but the long slide that the Fox coverage has morphed into makes all that easy to forget. The focus should be the racing, but it's not. That, along with BZF and his stupid ideas, have caused the fastest growing sport on earth to become feeble and weak. Any chance Hill could take DW and LarryMac with him to LA? Yeah, I know I'm only dreaming, but it would give NASCAR a breath of fresh air if all 3 exited. So last night I was at my neighborhood Applebee's, sitting at the bar having a late meal and a beer. Flat screen TV's ring the bar area, all tuned to sports action. The largest TV's were tuned to basketball. Basketball? I thought the NBA season was long over? It is. What was being shown in 60 inches of hi-def was NBA summer league play. Who in the world cares about NBA summer league? We are in the middle of baseball, NASCAR, and golf seasons. Why are we watching this garbage? Then it hit me.....there is a NBA TV, a NFL TV, a NHL TV, a Golf Channel, and all kinds of TV channels dedicated to baseball, fishing, poker, or whatever other silly "sport". But...no dedicated NASCAR TV channel. Basketball fans can watch junk-ball in 1080p year round, but NASCAR fans get nothing like it. The rumor is that Speed channel will be closed so the new FOX mgmt team can go after ESPN and their multiple media outlets. Fine. I watch Speed almost daily but it's not the same channel it once was. Most of the good automotive programming is on Velocity channel, anyway. So if Speed is closed for business, this might force NASCAR to create a NASCAR TV channel. Finally, we will all have what we really want, which is dedicated NASCAR programming 24/7. The Speed hosts and team members can switch over and a whole new world of NASCAR programming will be available to us all. If I'm going to be forced to watch pointless, lame sports at Applebee's, I'd much rather view a rerun of the 1987 Daytona 500 than NBA junkball or geeks in sunglasses playing cards. NASCAR and Fox are hitching their wagon to the 24-35 yr old demographic. In my opinion, I do not think they are going to fill the stands or stay at home on Saturday night or Sunday and watch NASCAR on Fox. The schtick, DW, digger, etc., that Mr Hill brought to the show does not resonate with the long time fans. NASCAR seems to think that putting a murdered rendition of the Star Spangled Banner is PC but most fans do not buy it. The empty seats and warm TV ratings should tell them something, but I don't think they will listen. fans.The most alarming thing i saw in that post was the possibility of shutting speed down to make a "general sports network" which is code for another mini-espn.UGH i really dont want or need another set of stereotypical talking heads threatning to kill each other over whether Tim Tebow can throw or if the "we get everything but still want to complain Lakers" will win another for Kobe.Im hoping JD with his mystical superpowers can reverse the rotation of the earth to save Nascar on TV so we dont dont have to deal with this.Im hoping sometime in the future we can get that Nascar network(or Nascar TV)to avoid all these problems,maybe with Nascar getting the digital rights from turner back it will happen.Hey it's the only so called "major sport" that dosen't have one yet(NFL network,MLB network,NBA TV,NHL network,Golf channel,Tennis channel,plus the college sports channels).Finally that "focused and calculated" new group is what scares me most.I am hopeful that new blood may actually help the sport,but im getting the feeling it's going to be more reality show gouging to drive us to insanity.Despite this years problems,i hope FOX stays in it,but one has to consider the possibility that maybe after 12-14 years,it's time to move on and get a fresh start,especially without the the man that's been there from the start. Anon 7:45. Thank you for that insight. Pretty much what I was thinking/hoping was the case. Digger & his merchandising (the main reason for his existance being $$$$) are gone, now maybe we can get the old DW back, although I fear he is gone forever (you know, the guy who looked out the window & paid attention to the race, who let Mike Joy do his job...) Because I fear that the new boss will think that schtick is working fine. DW did actually have some good moments before he decided he could read the drivers' minds and started back tracking every time he was proven wrong about something. If we can just get them to start showing the race without every gimmicky camera angle. Let's just hope, at the end, we have better coverage and end up with *some* kind of channel that covers what SPEED does now--and what they used to show & no longer do. Until I see what the new duo brings to the table, I cannot comment on whether this is a good move for Fox Sports or not. NASCAR on Fox needs a slight overhaul in my opinion. Chris Meyers and Mikey Waltrip need to be dumped. Meyers is a good reporter, becomes a hokey character on NASCAR broadcasts. DW needs to get back to his beginnings when he was a former champion offering honest, valuable opinions, not a goofball with corny sayings and not willing to criticize anyone for fear of alienating sponsors and/or drivers. They also need a new director, someone who understands motorsports and doesn't direct the race base on a script. Showing passes for the lead via replay while other crap takes place on-screen is a big fail. If SPEED is dumped or rebranded, I hope someone else will step forward to take over the other NASCAR coverage as well as showing ARCA, World of Outlaws, and Lucas Oil events. Something tells me that nothing substantial is going to change. Maybe a tweak here or a tweak there but it will be business as usual. Announce that one of the Waltrips (preferabley Michael) are going and I will be impressed. I'd like a more serious team in the booth that are more interested in following the race and less interested in entertaining us with mindless banter. how open Ray Evernham will be on ESPN since,as far as I know, he is still on the Hendrick payroll. I would like to say to Mr. Hill: "don't let the door hit you". Here's a short rough draft of my idea for a Nascar Network(this is obviously imcomplete,but this again is just a start).First off,make sure it's available on most providers and NOT on a exspensive package only. As for programming,as a base have a "Nascar central"program that is just a general nascar program but with actual "experts" like sportscenter in the good old days,as well as some programs dedicated to specific series.Then take some existing speed programs like trakside,raceday and of course practice and qualifiying,rework them a little bit,and throw them in.Im not sure if the money and resources are there for it,but if possible try to televise as many regional series as possible live.The modified series races are great,and i think these shows could become real cult hits.finally,as a bonus throw in as many Classic races as possible from all over the history and dont be dicscrimative(sorry for the bad spelling),show races from all different eras and not just sprint cup.to fill in the gaps both financial wise and programming wise,insert some infomercials during the times people aren't watching(unlike the golf channel used to do)and youv'e just about got a prime Nascar Network. Wow, I can't believe I forgot his 'tough' comment. Amazing how his treatment of others cycles around. Full business plans including programming, sponsorship and facilities for a NASCAR TVnetwork were presented to Brian France personally without success. As we have said about NASCAR many times, they are in the business of cashing checks, not writing them. And that's the sad truth about it,as long as BZF is in charge us fans will never get what we want.My dream is for Mike Helton(some may disagree but i think he would be good)to become in charge,but that's the key word,"dream". He's the best living option available,and although not perfect,i think he shares the same hunger for Nascar to return to it's glory days as us fans.We can always hope. "as a bonus throw in as many Classic races as possible from all over the history and dont be dicscrimative"
JD may have an answer. Years ago I had ESPN Classic and they used to show Nascar races from the 80s and 90s. Might have even shown some ABC stuff from even earlier. Would it be safe to assume that ESPN still owns those races? They most likely wouldn't play ball. I personally would have no use for "Classic" Nascar from 2002. The best coverage by far is TNT. Why can't we have a full season of Wally Dallenbach and split screen coverage? I will not rant on what I think of FOX. I subscribe to TRACKPASS and listen to the scanners. Too much "Fluff" and not enough "hard reporting. ESPN needs to give Ricky Craven a bigger role. Why can't the decision makers make good decisions? Mark Garrow should be UP FRONT but we get Matt Clark? C'mom NASCAR, Wake up! You might not like Dave Hill, but he became a real race fan and was an enthusiastic supporter of the sport. Contrast this with ESPN, which seems downright embarrassed to cover NASCAR. His replacement might not like NASCAR as much, and if so, things will get worse, not better. Anon 6:14 Yeah i remember(and it wasen't that long ago)when ESPN Classic actually showed some good stuff,and not just Nascar. They used to be awesome,but like everything else ESPN they tried to "restructure" it a few years ago and now all they show now is Bowling,nondescript boxing fights and a lot of other stuff that has nothing to do with "Classic". To top it off they made to where it's now only available on the more expensive packages of television providers,so i no longer have it anymore,not that i care about it now anyways.As for your comment on ESPN not playing ball,that could very well be true but for a time a couple of years ago Speed showed some "Nascar Classics" every thursday(although they never showed anything earlier than 2004,but i actually quite enjoyed them). I have been dying ever since it happened to get the 2004 Daytona 500 on DVD,but they have never made a dvd of it and i have almost given up on it,here's hoping i can find a way to get the best memory of my whole childhood on video sometime in the future. Im glad to see him go! I hope the Fox broadcats change cause they sure have stunk the past couple of years! I understand everyones signed on until 2014, If I was the new guys I would sit DW, Larry, and Mike Joy down and say ok lets do what you guys did in the early days of Fox! I feel in love with Fox from day 1 and that was in 2004. Fox was always king but I agree when 2008 came around things changed!!! and has gotten worse every year since. Espn may come out as king this year we shall see but it wont be very hard to top Fox and TNT cause they sure sucked this year!!!!!!!! All I'll remember him for is being a circus clown. 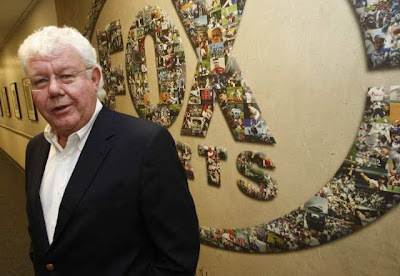 Cartoon characters and glowing pucks forever stained the image of Fox Sports under his leadership. He would have been better off running Nickelodeon or the Saturday morning cartoon division at Fox. Here's hoping for a "tough" transition during this non-promotion promotion. As for me I should like a column on Messrs. Shanks and Freer as well as on their new boss, Peter Rice. I have a hunch what would be revealed by that but I might be surprised. I would not mind a NASCAR TV Network. It would basically be the same thing as SPEED, but without stupid shows like Pass Time, Pimp My Ride, etc. I think NASCAR would still show other series because not everything can be NASCAR, so programming like Grand-Am (owned by NASCAR), ARCA, among others could still be shown. I would just guess that F1 would just stay on FOX where it is. Great news that Hill is leaving. Now if he could only take brian france with him. Since Shanks and Freer were Hill appointments, one wonders if their days are numbered. The whole group of 'yes men' were nothing more than bloated bullies. Just like with the news, Fox/Murdoch ruined NASCAR on TV and they ruined Speed. We call that "broadcasting with a body count". Hey Colorado - You are right - Eli Gold would be PERFECT. One of my favs. Good bye and good riddance to Hill. The only thing that would be better is if he took the Waltrip brothers and Kenny Wallace with him. I hope someone at Fox decides to return to covering the racing and end the circus sideshows driven by personality. But I'm not optimistic.